Activity: Walking tour through emblematic Jamonerías + Ham Taste. Services: Local guide. Departure: From 01 April to 31 March. Days: Tuesday, Thursday and Saturday. Time: 13:30h. Duration: 2h 30min. approx. Starting point: Plaza Isabel II, Right beside statue of Queen Isabel II (Metro station Opera). Conditions: Advance booking required. Cancellation fee: 100% for less than 48 hours notice or no-shows. Languages​: Spanish and English. Blackout dates: 24dec, 25dec, 30dec, 31dec, 1jan. Book at least 24 h. advance. This tour is not recommended for people with restricted mobility. Learn about Spanish wine and discover traditional Iberian Ham houses in Madrid. During this 2.5-hour tour, taste several cuts of Iberian products like chorizo, salchichón, lomo, and ham paired with Manchego cheese and other classic tapas. As you do so, learn about the fascinating history and culture of wine, the differences between each type of ham you can find in the market and master how to shop for them like a local. In our Ham´s Tour: We´ll visit Emblematic and High Quality Jamonerías (Home of Ham). Do you know the difference between Jamón Serrano and Jamón Ibérico? 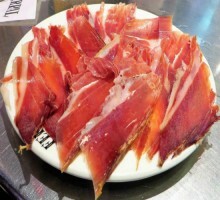 Do you know the difference between Jamón and Paletilla? We´ll explain it to you. 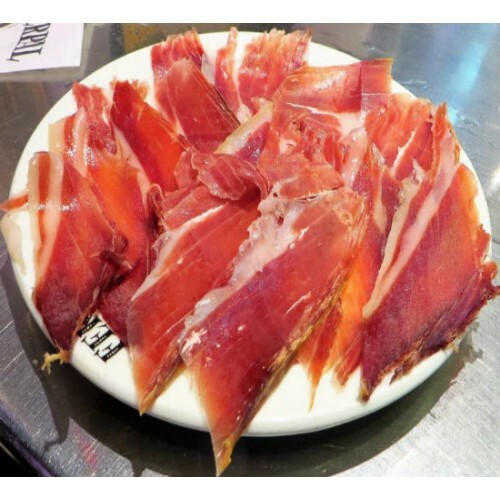 Learn all about the wide range of Ham (Jamón) and its related products. We´ll show you where to find the Jamón Iberico´s protected Qualified Appellation of Origin in Spain. Taste & See how a Professional Ham Cutter creates those delicious thin slices with his special long knife. You will experience first-hand why Iberian ham (Black hoof) is so delicious and unique…and also healthy. We will also taste Spanish’s olive oil virgin extra, and we will learn and taste the most typical lunch in Madrid: cocido madrileño (madrilian stew).